The Department of Music in the The School of Arts and Social Sciences welcomes Tullis Rennie, Aaron Einbond and Laudan Nooshin as part of its 2017-18 Research Seminar Series. 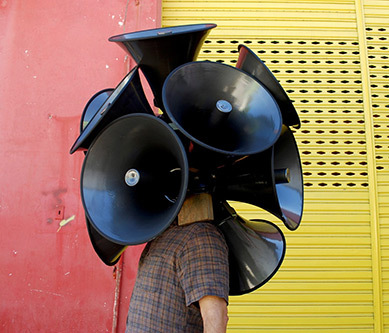 Carioca Sound Stories (Rennie, 2014) presents practice-based artistic research in sound undertaken in Rio De Janiero, Brazil. The work develops the interdisciplinary method described above, combining reflexive field recording and ‘context-based composition’ (Truax, 2012). Gregory Barz’s ethnomusicological fieldwork methodology is key to the work, in which Barz describes field research to be ‘one of the most meaningful processes engaged by ethnomusicologists to define themselves’ (2008: 206). Carioca Sound Stories translates Barz’s concept of ‘headnotes’ into visual annotations, whereby the piece simultaneously conveys experiences in the moment and reflections gained with hindsight. How can the city become musical material? Field recording is a starting point, as are the experiences of its inhabitants including the performers and composer. Audio recording and transcription translate these impressions into instrumental scores, which in turn are reinterpreted in performance, re-injected back into the cities that produced them. Iran’s capital city is a vibrant metropolis, cradled in the foothills of the Alborz mountains, and the country’s political and cultural centre for over 200 years. During this time it has experienced exponential growth from a small town to a city of more than 8 million. Drawing on recent fieldwork in Tehran and on the writings of scholars such as Matt Sakakeeny and Abigail Wood, this paper examines the city’s changing soundscapes and explores a number of questions concerning the relationship between sound and the urban environment: how does sound shape, and how is it shaped by, the urban context? How are contesting claims over urban space negotiated through sound? And how does sound acquire meaning in relation to both public and private, live and mediated experiences?